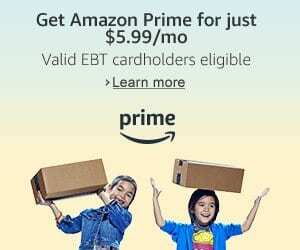 Amazon is wanting to make Amazon Prime membership more affordable to lower income households by offering it for just $5.99 per month for those who are EBT card holders & Medicaid card holders. That works out to $71.88 per year, so provides some savings over the standard price of $119 per year, and it allows folks to pay monthly, versus having to come up with the annual payment in one lump sum. If you qualify, you can go here and enter your EBT number and upload an image. The EBT card will not be used to pay for your membership, only to confirm eligibility. You will then be able to sign up on the monthly payment plan, and can cancel at any time, and will have access to all Prime Membership benefits. Note: This monthly offer does not include Household sharing of Prime benefits. You will need to qualify every 12 months, for up to 48 months. If you have not joined Amazon Prime yet, you might want to try the 30 day free trial offer. Amazon is offering a FREE 1 Month Trial of Amazon Prime. Not only is it great for free shipping, but we use it like you would Netflix and stream the free movies and TV shows to our TV! Are you a student? If so, you can get a free 6 month trial for Amazon Prime for students. After the 6 mos, you will pay just $6.49/mo & can cancel at any time. PLUS, if you want to give a membership as a gift, you can buy a 3 month Amazon Prime Membership for just $38.97 here too! Amazon will send your gift recipient an email on the day you choose along with redemption instructions. The gift recipient can start their Prime membership right away. If the recipient is already a Prime member, the gift can be exchanged for an Amazon.com Gift Card. The gift membership does not automatically renew and is not eligible for promotional offers. The gift of Prime can only be redeemed on Amazon.com. This is really a great gift idea, as it offers streaming movies and TV (like Netflix), so it could be a great fit for anyone – not just regular Amazon Shoppers. I do also love the idea that those that have Prime can add it on to their subscription, so its a great idea for many folks you may be shopping for! If you have not tried it, I highly recommend this free trial. 30 days gives you enough time to decide if its a good fit for your family or not. Since my kids like movies and we like to shop the deals through Amazon, it is a good value for us. Beyond the shipping, it’s also a great program for the free Video and book rentals, or free streaming TV options. It works similar to Netflix in that you can stream their videos to your TV, Kindle or other devices. We grabbed the free trial before our recent roadtrip, and the kids were able to download some of their shows for free to watch on the road. Whenever we pulled into a spot with free internet, they could connect and grab new books or shows – so it was a great option for the road trip. Plus once, we got home we streamed it to our TV through the Xbox (you can use other options), and figured that Amazon Prime was cheaper than other subscription plans available and you get free shipping too! Do you use Amazon Prime? What are your thoughts on why you love it, or why you do not use it?